Leading up to the 2008 financial crisis lay a period of unprecedented growth for the industry. This was accompanied by an inflation in bankers’ remuneration packages, which started to move into the spotlight amid the crisis that caused hundreds of thousands to loose their jobs across the world economy but was largely caused by the financial sector in a few countries. The public outcry that followed in the form of various social protest movements such as ‘Occupy Wallstreet’ in the US and ‘Blockupy’ in Europe have likewise been unprecedented and brought politicians and regulators on the scene to scrutinise incentivisation schemes and associated regulation in the financial services industry. Especially governments that had bailed out individual banks and thereby effectively nationalised them, were seeking to cap bonus payments in a way that calmed public sentiment and restored a sense of responsibility and fairness. The issue of pay and incentives at banks has started immediately after the crisis and hasn’t since subdued, although gradually being addressed by international regulators. Table 1 – Remuneration reduction expressed as a gain in Tier 1 ratio. Data from 2008 and 2009 by the top 100 global banks ranked by asset value in 2011. The resulting logic from this study was clear: If banks were to cut their remuneration bills by only 20% then the equivalent increase in the Tier 1 ratio would be 37 basis points on average, which would make banks and their industry safer and more stable. A crucial part of Basel III were the so-called ‘capital conservation buffers’. These require banks to hold an additional 2.5 percent of Total Capital in the form of Common Equity Tier 1, above the 4.5% minimum. This, effectively, brings the Common Equity Tier 1 requirement to 7%. While a bank may go below this ratio in periods of stress, the bank must rebuild the buffer by means of reducing discretionary distributions. The Basel Committee of Banking Supervision (BCBS) contemplates that resulting reduction will come from decreases in dividend payments, share buy-backs and bonus payments. If, for example, a bank had a Common Equity Tier 1 ratio of 5.5% and a capital conservation buffer of only 1%, the bank would have to conserve 80% of its earnings in the following year to rebuild the buffer, as their current year’s ratio is below the standard of 2.5%. This limits discretionary distributions to only 20% of earnings. In many cases this will effectively translate into a cap on bonus payments. ((Weil, Gotshal & Manges LLP. (2011). Banking and Financial Services. Policy Report , 30 (5), 1-18.)) The detailed restrictions of discretionary distributions, under which bonus payments fall are outlined in Table 2. Table 2 – Capital conservation buffers and their effect on staff bonus payments as part of discretionary distributions. a long time. ((White & Case LLP. (2013). Shooting in the dark: A review of the implications of the bonus cap. London: Nisus Consulting.)) For many banks, this means having to transform variable pay into fixed pay, which significantly increases bank’s fixed costs. The extend to which this will affect banks across various countries can be estimated from the prevailing fixed-variable pay-ratio seen in Chart 2. Another regulatory requirement that caused severe headaches for banks to implement was Clawback. An executive of Investment House, North America, was quoted as saying “Nobody has a problem with clawback in principle but nobody wants to be the first to test it in a court of law. Going back to somebody and saying ‘We want some of that bonus back’, will be very interesting.” ((White & Case LLP. (2013). Shooting in the dark: A review of the implications of the bonus cap. London: Nisus Consulting.)) It is generally perceived that such clauses will be particularly difficult to enforce in Spain, Germany, Italy and even the UK du to their respective legal systems that are likely to favour the employee in any appeal. The general public perceived the prevailing bonus culture at banks as morally broken and the way with which they were defended as arrogant. 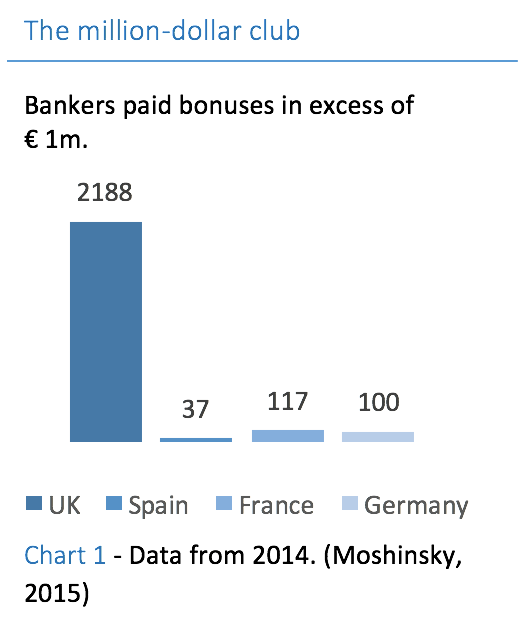 Many saw the clear issues that arise from banks guaranteeing certain bonus payments for three years, as has often been the case before the crisis. It is obvious that such schemes don’t incentivise employees appropriately and certainly don’t discourage excessive risk taking. While such schemes were common for the industry, it was far from comprehensible to most outsiders. The financial world simply perceived bonus payments to be salary, without regard of performance. As a result it was not uncommon for investment bankers to reason that simply because of who they were, in terms of position or otherwise, they would be entitled to such payments. As banks started to need government support, such thinking became intolerable for policy makers to leave unaddressed as they struggled to explain to their voters why banks – and bankers – had to be saved. (De Cremer, 2015) Public sentiment has remained hostile towards banks, to which the community was reminded by a recent attack on Mario Draghi during a press conference. As regulators are largely driven by politicians, banks will remain their focus for as long as the financial services industry remains untrusted with most voters. After decades of deregulation and unsustainable remuneration policies, the recent financial crisis has marked a turning point in the regulator’s eyes. For the first time, both governments and financial regulators have directly targeted banker’s pay in their efforts to deflate a sector that proved too risky to tolerate and in the light of public sentiment. Likewise unprecedented was the scale on which such regulation has been rolled out. While not enacted globally by any stretch, some of the most important financial hubs have seen serious reform targeting remuneration policies and while many financial institutions voiced concern, the need for reform was too obvious to deny. What is more, banks have already started to implement most policies and have already reacted structurally to the policies and regulation enacted by their jurisdictions through restructuring and strategy refocusing. The effects are serious but it is not yet clear if the desired outcome of using remuneration policy as a regulatory tool to deflate risk in an entire industry will materialise. While banks are largely cooperative, they naturally seek to maximise profits and find ways around any regulatory obstacles that might be in the way. This asserts that an economy can suffer a serious threat to its stability and indeed a wider slowdown from an overblown sector. Much like some countries suffer from a ‘resource curse’, some now evidently find themselves spelled with a ‘finance course’ in which a sector of its economy is blown up to a size far exceeding the benefits it brings to society and other sectors leaving it to creating ‘unnecessary’ systemic instability. This is heavily linked to remuneration in finance, as the sector has on top of that attracted some of the brightest people, through high – and on a bigger time scale unsustainable – pay. Some have argued that banks are actually utilities, providing the necessary ‘resources’ for the economy to innovate and operate efficiently and that therefore they should be regulated as such. As illiberal and anti-free-market it may have seemed to many just a few years ago, regulating pay relative to benchmarks might actually be the key to deflate the financial sector, thus creating a finance industry that better serves the wider economy. Past crisis have proven time and again that an unregulated finance industry poses too high a risk for society to accept. Regulation has been imposed and retracted for over a century to varying degrees of success. Now, remuneration is targeted directly by regulators for the first time and only time will tell if this proves to be the right tool to tame an unabating systemic threat to the world economy. ← Reinventing Henry Ford – My take on tomorrow.